Mazda remains the world's only manufacturer committed to rotary engine technology. The latest RX-7 is smoother and faster than its forebears, but is that enough....? Throughout its evolution, from naturally aspirated rotary to the present 237 bhp compact supercar, the RX-7 has been a familiar site at Standard House. We have had plenty of road and track time, at Donington Park, to assess the latest format of the gallant rotary engine from the first Japanese company to win Le Mans. As the performance of the RX-7 has escalated from baiting the Porsche 924 through to direct confrontation with the latest 968, Mazda's original low-cost priorities seem to have evaporated. 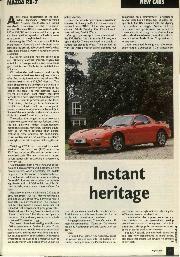 True, the RX-7 is not quite the £34,000 that was predicted at the June 1992 launch, but it is not cheap at £32,536. Its thirst at the fuel pumps remains prodigious if you - like us - enjoy its unique performance. In compensation, the driving experience is extraordinary, not just for the technically intriguing fact that 1308 cc is transporting you to 155 mph and returning six-second 0-60 mph figures, but for the extra terrestrial smoothness conferred by a rotary that prefers to hum at 7000 rpm. Don't ask, but be warned that 20 mpg was a rarity. 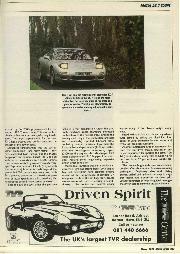 . .
Only one RX-7 model is brought into the UK, and that is the more heavily equipped, expensive and heavier European version reported here. With the advent of the Porsche 968 CS (see New Cars), we may see Mazda retaliate with the cheaper, lightweight RI specification that they market elsewhere. Sales of £30,000-plus sports cars are not blooming at present, witness the £5000 that has just been lopped off the Alpine Renault A610's price. Other Mazda sports offerings for the UK include the MX-3 front-drive coupe (a sort of retro Honda CRX, but with sweet V6 power) at £13,689 for the 1.6i or £15,729 for the 1.8i. Then there are the vastly popular rear-drive MX-5 (did this car kill the Elan, or did Lotus management manage that without assistance?) and the super-smooth MX-6. The MX-5 is now priced from £15,780 and 2.5 V6 MX-6s start at £18,519. Also encroaching into the BMW 3-series heartland of the home counties is the Xedos 6, priced from £17,509 to £20,140. Essentially this RX-7 is a reincarnation of what has gone before, but reworked with extraordinary determination by 120 Mazda engineers, designers, testers, product planners and manufacturing men. Their targets centred on the increased showroom appeal of a svelte 0.3 I Cd profile that included major influence from Mazda's Californian facility, an output of 250 bhp and a 1250 kg kerb weight. The two-seater body was a major success with American customers. 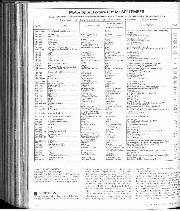 Some RX-7 derivatives available in the USA feature the aforementioned RI spec and 255 bhp, rather than the 237 we are offered on this side of the Atlantic. In European terms, we simply see a progression from the previous single turbocharger 13B rotary, with its 200 bhp. During our test, we switched briefly to one of the outgoing cabriolets. Progress has certainly been made under the bonnet. 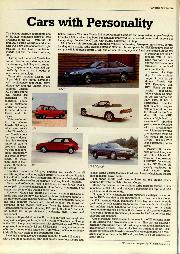 The Japanese engineers were actually inspired by the 230 bhp powerplant for the elegant 1990 Cosmo coupe. 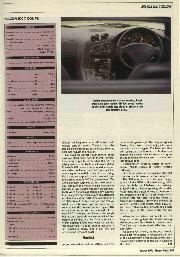 This was the first Mazda to feature a turbocharged rotary installation. The larger capacity unit for the new RX-7 has increased both performance and the breadth of the power band. 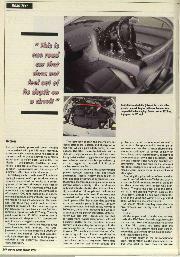 Sequential turbocharging was the secret. Other production - and many racing - cars have exploited twin turbos, but the Mazda design uses one compact Hitachi HT12 to deal with boost demands up to 140,000 turbine rpm. Interconnected by an electronically managed flap valve, a second Hitachi (they're both the same size) is activated fully beyond the preset 140,000 rpm of the primary unit, but is fed a growing proportion of the exhaust gases even at lower speeds in a bid to avoid any flat spots as the second turbo comes on stream. Since the 200 bhp days, other changes have included higher compression within the precisely machined rotor chambers, increased coolant flow to the hottest areas (around the leading spark plug in the combustion process) and considerably uprated lubricant flow, cooled by twin air radiators. If you take the Mazda's literal displacement (1308 cc), rather than the homologation equivalency figure (2300 cc), the sequentially turbocharged RX7 yields a phenomenal 181.2 bhp per litre, which does require some engineering expertise under street conditions. Mazda took immense trouble to produce an attractive, light and strong body (both engine bay and power-train have separate bracing measures). Yet the presence of standard UK equipment such as the air bag, four-speaker stereo, leather trim, power steering, air conditioning, cruise control and central locking negates many of the obvious weight saving ploys. Faced with a list like that above, any advantages gained by drilling the aluminium foot pedals or using aluminium for the bonnet and wheel jack are soon overcome. Another outstanding area of endeavour has been the rear-drive chassis, unusual in our recent experience for sporting the same (106 lb/in) front and rear spring rates to support a '48 per cent front, 52 per cent rear weight distribution. The unequal length wishbones are conscientiously crafted via a variety of aluminium casting techniques. Deploying directional sliding bushes, uniball and hydraulic bushings is a sign that Mazda puts a premium on sheer grip, virtually regardless of what misguided messages the driver uses to flummox the basic balance. The attractively presented silver metallic coupe arrived with just 555 miles recorded, so we were a bit dubious about its potential at the test track. A trip to Snowdonia in North Wales took us safely past 1000 miles. The Mazda - unexpectedly available at short notice, albeit for less than the usual week's duration - was returned with the best part of a further 1000 miles on its odometer. 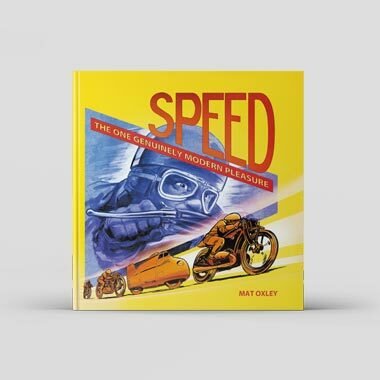 Stretching stably to an honest 155 mph and zipping from rest to 60 mph in a sliver over six seconds, we noticed no penalty as a consequence of the fresh drivetrain, save that of fuel consumption. The rotary has always been notorious in this respect and the combination of a regular 7000 rpm (marked by an audible warning beep) and comparatively low mileage did Mazda no favours whatsoever. Our average was 16.66 mpg and it took conscious restraint to realise 20. That's not too surprising, because the mandatory urban fuel consumption report records 17.7 mpg. The only good news is that 95 RON unleaded fuel is recommended, despite a 9:1 compression ratio in a turbocharged application. There are several attractive features in the two-plus-cubby hole interior. The large, Jones-copy rev-counter reads to a 9000 rpm maximum, red-lined at 7000 (not exceptionally high, these days), but no boost gauge is included in the otherwise comprehensive instrumentation. The seats look good in the showroom, but could offer more location and absorption of the ride, which is particularly bumpy at town speeds. The other chassis limitation is that the 255/50 Bridgestones are forced into tramlining activities that wriggle the steering wheel over adverse cambers and bumps with nearly as much vigour as the stark 911 RS or an ancient rear-drive Ford. As a driving experience, the speed variable power assisted steering, slick rod-linkage gearchange (slightly notchy from fourth to fifth) and sensibly advanced ergonomics mean that urban progress is just as painless as in any current saloon. Visibility within the dramatically styled body is better than that traditionally provided for GT coupes and the Mazda is very easy to live with, even if we were not overwhelmed by the comparatively tacky plastic petrol filler flap amidst that sparkling extra cost metallic paint (£165.04). Although the engine sounds, and feels, totally normal to 3000 rpm, there is no mistaking the whoosh of serious pulling power thereafter. Unfortunately two cars that I drove, and one that co-tester Mark Hughes experienced, suffered a distinct stutter on the transition between primary and secondary turbochargers. In the low mileage test car, the apparent gulp was at its worst. We nearly abandoned the test after a stuttering cold start forced one driver to return back to base, without ever getting the rotary into the boost sequence. 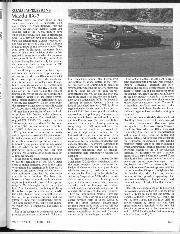 From that point on the car was driven around the problem - rather as one used to with a carburettor flat spot - and it was simply an annoyance rather than a major shortcoming, the utter civilisation of power delivery on boost being more than sufficiently addictive to overcome such unwelcome hiccoughs. The dry and smooth road handling qualities are astonishing. This is one road car that does not feel out of its depth on a circuit and the writer retains warm memories of its capabilities at Donington. Attacking the grim realities of wet weather travel from Oxfordshire to Wales and back in a day, the RX-7 continued to excel, aided by excellent brakes with very modest ABS interference. The grip levels feel up to the standard of a mid-engined warrior such as the Lotus Esprit. Since this is achieved without the girth of the Lotus and within a very practical body, we salute a fine achievement. 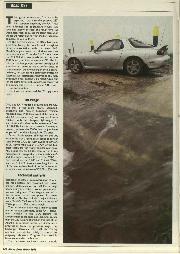 So should Mazda handling earn absolute rave reviews, wet or dry, circuit or public road? 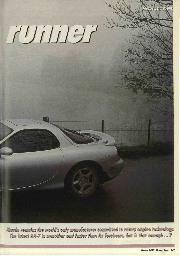 At the upper level of endeavour on wet roads, the RX-7 feels distinctly edgy. Ironically we can most liken the experience to driving an older 911, where you eased open the throttle on a leaf strewn third gear corner, aware that punishment lurked beyond apparently inexhaustible grip. You sweat gently in the air-conditioned cabin, feeling rather like the lion tamers of the '50s who used to prod their unfortunate charges via long rods in an effort to obtain remote control mastery. There is much the same feeling of suspense as the Mazda steering becomes heavier and heavier. You await the inevitably swift reprisal, at the now low-effort helm. As with the 911 of yore, leave a big margin for error when the RX-7 is edging towards the limits of adhesion. Unlike Porsche's 968 or any number of old fashioned rear-drive machines, the RX-7 does not like operating in the twilight zone of hard driving. For a day, we stepped back in time and tried the current model's 200 bhp predecessor. We were honestly surprised at just how good it was, although the messy orange instruments and lack of wet weather traction on comparatively worn Yokohamas stopped any eulogies. Our strongest impressions were of outstanding acceleration and the rattle-free operation of a 36,000-mile old H-plate example, one that we would probably prefer over the coupe for the summer months. Steven Tee, our regular RX7 convertible incumbent, commented of the new RX7: "I thought the ride was a bit rough, but the car is generally much more refined than before and I liked it a lot. I'm not sure it is worth another £9000 over what we paid for the convertible. It's good, but not that good. A bit expensive really, but I did like the acceleration, style and seats." 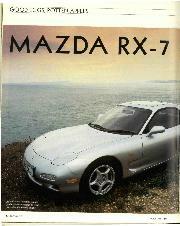 Judged in isolation, the Mazda RX-7 is a pretty, desirable, original coupe. The unique engine is flawed, but even more enjoyable with sequential turbochargers. The levels of adhesion generated by Mazda and Bridgestone engineering exceed that of many road tyre equipped racing formulae cars. . . as does the fuel consumption. 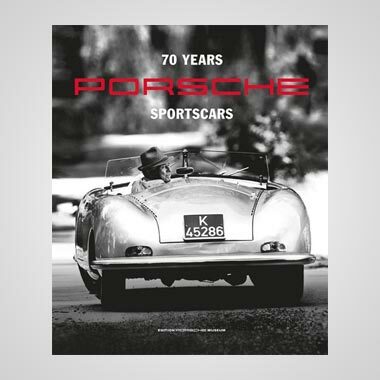 Unfortunately, either by design or coincidence, Mazda seems to target Porsche ruthlessly. On this occasion the beleaguered Stuttgart company has the answer. Several, in fact. The 968 may not have the fresh design appeal of the RX-7 (refreshed though it is over the 944), but I believe the 'ordinary' £33,547 968 is a better sporting all-rounder, never mind the better driving experience of the stripped-out 968 CS, a lightweight fourcylinder that may also meet the needs of former (or potential) BMW M3 owners, as well as Porsche enthusiasts, from £28,750. 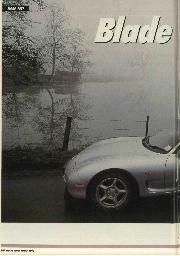 For those with more than £37,000 and a taste for the open air life, there is also the 968 cabrio. 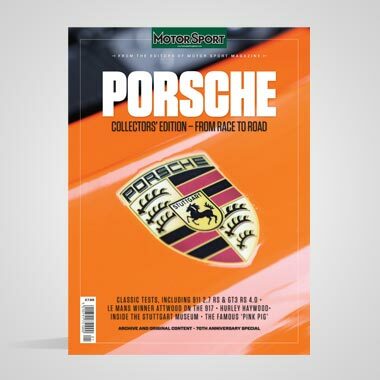 Whatever, we believe that Porsche has - at long last - recognised the life-threatening challenge posed by Mazda in recent years. The Germans have retaliated effectively, and affordably. As to the RX-7 itself, we suspect it would make a lot more sense in recessionary Britain at the substantially lower asking prices that it was originally designed to achieve in Japan and the USA.